World 8-4 is the fourth level of World 8 in Super Mario 3D Land. This level is a Ghost House level. The player starts on a staircase-like platform. Upon reaching the end, a section of platform begins moving along on its own. The platform later connects to another platform, which contains an unlit torch and several ? Blocks. Mario must then jump onto a Switchboard, while avoiding several small and large pushing walls, as well as three Tail Boos. The platform at the end of the Switchboard's path contains the Checkpoint Flag. The platform after this is circular and continuously spins around. In the center is a ? Block containing a Super Star, though five Boos (one being a Tail Boo) spawn as soon as it is hit. The next platform moves as soon as it is hit; the player must avoid several Peepas and Boos, as well as a Big Boo as it travels along. The platform's destination contains the door leading outside with another moving platform and the Goal Pole. Star Medal 1: After hopping onto the Switchboard, the player should chase the Star Medal while avoiding the pushing walls. Star Medal 2: After the checkpoint, the player should come across a large rotating platform. The second Star Medal is found on the edge of it. Star Medal 3: On the final moving platform, the player comes across some Peepas and Boos. 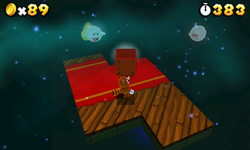 The Star Medal is found behind two Boos, though the player must avoid the Big Boo that appears right before it. At the beginning of the level, there is a window, and if the player insists on standing near it for a few seconds, a ghostly, Shy Guy-like figure will appear outside for a while. After quite some time, the silhouette will fade away with its mouth wide open. The same thing happens if the player stares at the background near the flagpole, on World 4-4 and Special 6-5.